Be the first to share your favorite memory, photo or story of Frederick. This memorial page is dedicated for family, friends and future generations to celebrate the life of their loved one. Frederick "Fritz" Wampfler passed away on February 28, 2018. Fritz was born to Lloyd J. and Dorothy (Werntz) Wampfler on February 29, 1928 in Beach City, Ohio. He married Doris Bender on October 21, 1950. Fritz served in the United States Air Force during the Korean War and later was a claim manager for the St. Paul Insurance Company for twenty-eight years. Fritz raised, showed and bred American Quarter horses and was a Director Emeritus for the American Quarter Horse Association. 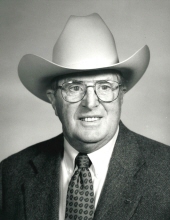 He was past President and Honorary Vice President of the Rocky Mountain Quarter Horse Association, and was inducted into the Rocky Mountain Quarter Horse Hall of Fame in December of 2015. He is a Member Emeritus of the Pikes Peak Range Riders and a member of the Southern Colorado Cutting Horse Association. He is survived by Doris, his wife of sixty-seven years; sister, Jeanne Hoskins of Canton, Ohio; two nephews; one niece; and three special couples, Randy and Patti Craig, Mark and Mona Stenson, and Russ and Lynda Henninger. He was preceded in death by his parents; sister, Donna Robb; and his brother-in-law, Richard Hoskins. Memorial Service, 2:00PM, Sunday, March 25, 2018 at The Springs Funeral Services, 3115 East Platte Avenue, Colorado Springs, Colorado 80909. Graveside Service, 11:00AM, Thursday, March 14, 2019, Pikes Peak National Cemetery, 10545 Drennan Road, Colorado Springs, Colorado 80925. In lieu of flowers, donations may be made in Fritz's memory to Rocky Mountain Quarter Horse Association, Pikes Peak Range Riders Foundation, Pikes Peak Hospice Foundation, or a charity of your choice. To send flowers or a remembrance gift to the family of Frederick Edward Wampfler, please visit our Tribute Store. "Email Address" would like to share the life celebration of Frederick Edward Wampfler. Click on the "link" to go to share a favorite memory or leave a condolence message for the family.